Blend Your Writing and Grammar Instruction with CaptivationStation! Have you considered using a blended learning approach to teach writing and grammar? Joanna Van Raden, the 2015 Michigan Technology Teacher of the Year, decided to blend her instruction with WriteSteps and discovered this approach had numerous benefits in her classroom. Here are 18 reasons why you should blend your writing and grammar instruction. 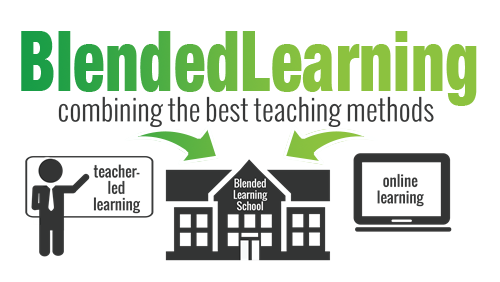 With blended learning, you will have more time for individual and small group conferencing. This allows for more opportunities to differentiate and personalize instruction, which helps you better meet the needs of each student. With students working independently, there is a decrease in whole group management problems. With online practice, there is less usage of paper, which makes organization easier and is better for the environment. Adding the social aspect of writing digitally and posting work to a broader audience reduces problems caused by trying to motivate reluctant writers. Since students can receive feedback from a greater audience, you are relieved of some of the pressure related to commenting on everyone’s work. Blending your instruction gives you the ability to collect and monitor student data and progress. The data you collect can be shared immediately with other staff members. You can check your student’s work and progress at anytime and anyplace, regardless of whether you are in the classroom or not. Student assignments and writing pieces can be shared with parents in real time. Students become more engaged in the writing process, and take more ownership of their writing. Students work harder and are more motivated when they realize the impact they have on their own progress. Blending your writing and grammar instruction allows your students to control the time, place, path, and/or pace of their learning. Students have more choice in what they do with their writing, e.g., write for a longer period of time, add creative publishing methods such as movies, podcasts, and eBooks, and publish to people outside of the class. Student writing time increases because there is less time spent in whole group instruction. There are different avenues for revising and editing, besides the traditional independent paper and pencil method. Students are more likely to stay engaged while improving their work. 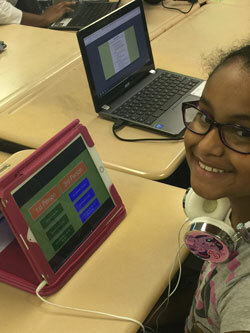 Students write digitally, which prepares them for online writing assessments. Online peer feedback mimics the social media type experiences students have outside of the classroom. This makes the participation relevant to their generation. Knowing that peers can see their work online motivates students to do their best. Absent students can complete the lessons anytime, making it easier for a student to catch up on missed work. Joanna Van Raden saw her student writing scores on both common assessments and state writing tests improve significantly after blending her writing instruction. Yours can too! Blending your writing and grammar instruction is perfect in theory, but in reality you might be wondering how you have the time to create blended learning lessons. The great news is you don’t have to, we did the work for you! CaptivationStation helps classrooms harness the power of blended learning. It’s a first-of-its-kind instruction and practice platform for 3rd-5th grade students. Students acquire their standards-based writing and grammar instruction through daily Captivator videos, write online, receive peer and teacher feedback, and much more! See the powerful platform in action here! We are proud of the Captivators videos developed by the amazing Ms. V, a.k.a. Joanna Van Raden, whose likeness is captured in image to the right. Captivators are the daily writing and grammar instructional videos found in CaptivationStation. Before Captivators, teachers needed to spend a minimum of 50 minutes, 4 times a week, teaching their whole group lessons and only having 15 minutes for students to write. Now with the Captivator videos, a day’s lesson is reduced to 7 minutes or less, which gives students a lot more time to write and teachers more time to personalize instruction in 1 on 1 writing conferences. Don’t have enough computers in your classroom for the full CaptivationStation? No worries! We understand each classroom has different needs. 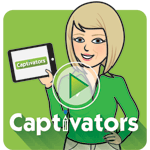 Captivators can be added to any eWriteSteps account. Administrators…Help Your Teachers Build a Blended Writer’s Workshop to Personalize Learning! Are you trying to build stronger writers that know how to use technology effectively to think critically, create, communicate, and collaborate? teachers are shifting the time balance from traditional direct instruction toward self-directed learning by leveraging technology. students are gaining the opportunity to learn at their own pace and receive more differentiated instruction from their teachers. technology is being utilized to provide greater instructional fidelity and create more confident writing teachers. P.S. If this time doesn’t work for you, register anyway and we will send you a link to the recording. Teachers at Carver Elementary were so excited about CaptivationStation that they invited their local news channel to come check it out! We are proud of the impact CaptivationStation is already making in classrooms. It’s part of the schools digital blended “WriteSteps” curriculum that helps kids improve writing and grammar. “It helps me make my writing better and use some stronger words. Instead of just ‘went,’ you can use words like ‘ran’ or ‘sprinted,'” said Logan Decker, a 4th grader at Carver. “It’s a lot better going at your own pace and doing it on your own verses doing it as a whole class lesson,” explained Carver 4th grader Callie Davis. It’s been used for about three weeks and Mrs. Watkins says she can already see an improvement in the kids’ writing. Click here to read the rest of the article and watch the video! WriteSteps will be at the International Association for K-12 Online Learning Conference (iNACOL) in San Antonio, TX! Stop by our booth to learn about our blended learning instruction and practice platform, CaptivationStation! Meet us in St. Louis! Awareness Ambassador Ben Kutz will be at the Missouri Charter Public School Association Conference! Stop by our booth to learn more about Captivators and CaptivationStation! Kim Gates, National Presenter, will be at the Georgia Educational Technology Conference to answer any questions you have about WriteSteps! Copyright © 2016 WritingCity, All rights reserved.